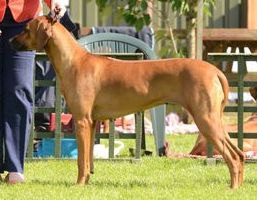 Sam is a UK and Australian Champion, and before coming to live at the Sonstraal Kennel he qualified for his Australian title in style by winning Best in Show at an All Breeds Australian Championship show in 2004. 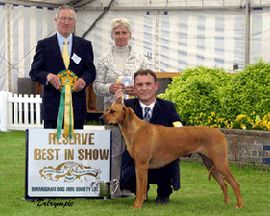 He is the first Australian bred Ridgeback to have gained a UK Champion title, which he achieved in August 2006. 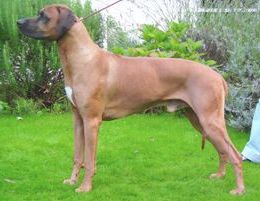 Sam has won 7 Challenge Certificates, 1 with Best of Breed and a few Reserve Challenge Certificates. 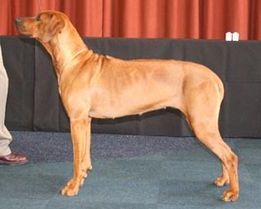 He also qualified for Top Dog of Scotland 3 years running. 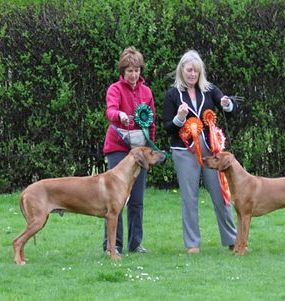 Sam has sired 7 UK Champions, pictured to the left. 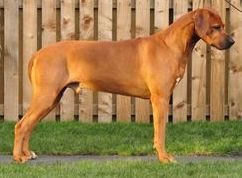 He was awarded Top Stud Dog in 2008, 2009, 2011 and 2013 - quite an achievement for one who has been used only a handful of times at stud. 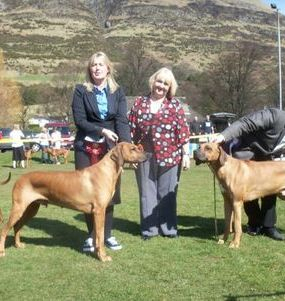 Sam pictured above with his daughter Fudge at her first show - she won BIS and Sam won RBIS!